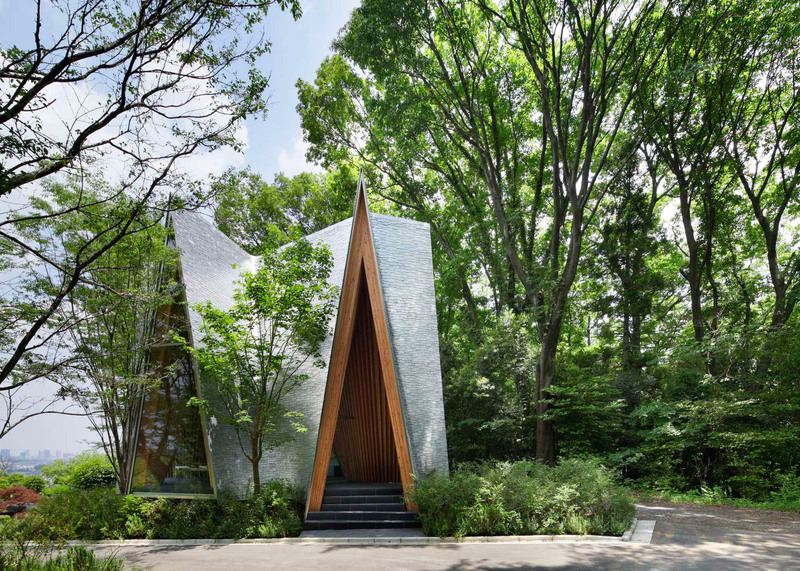 A+Awards: next up in our series on winning projects from Architizer's 2016 A+Awards is a small chapel by Japanese architect Hiroshi Nakamura, which features extreme gables and a roof covered in 21,000 aluminium shingles (+ slideshow). 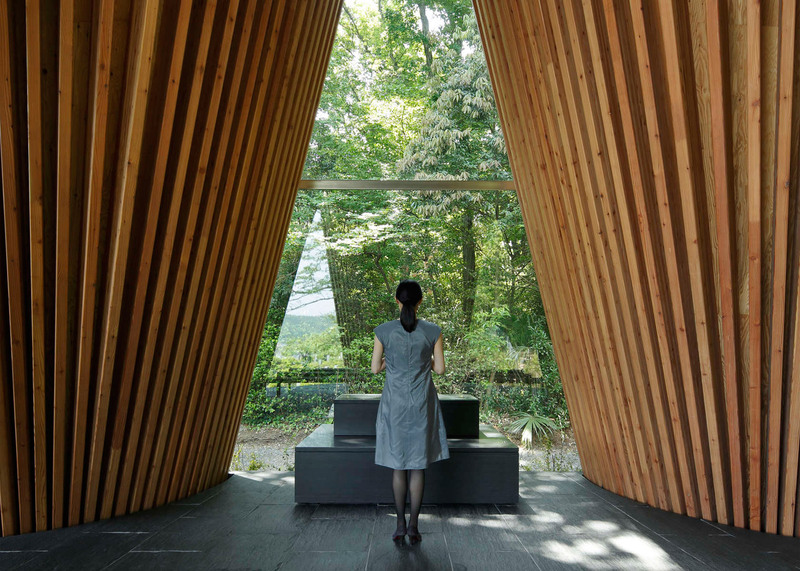 Nakamura and his Tokyo studio NAP created the Sayama Forest Chapel for a site at the edge of a forest, which forms part of the non-denominational Sayama Lakeside Cemetery in Japan's Saitama Prefecture. 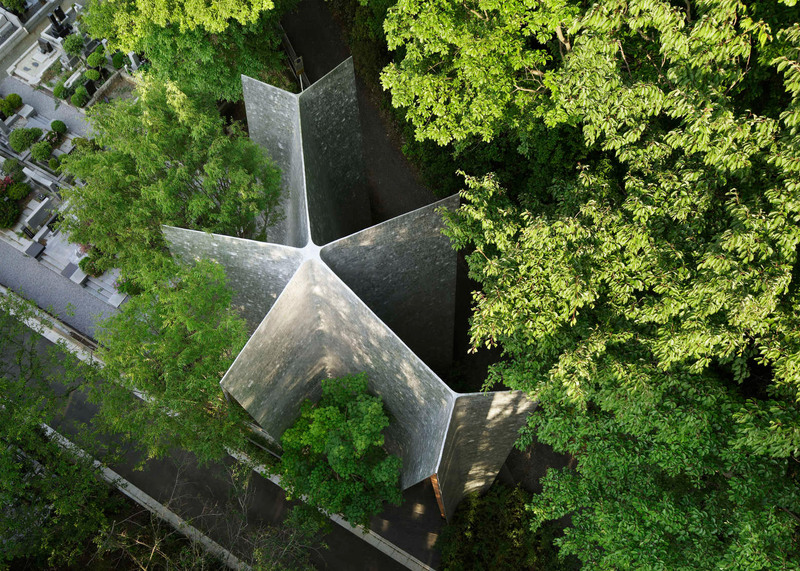 The studio – best known for its Ribbon Chapel wrapped in twisting staircases – was assigned a small triangular plot adjacent to a quiet road for the chapel, which provides mourners with a quiet place to pray. "I envisioned an architecture that reflects on the life as it lives by the water conserved by the forest, and eventually returns to this place after death," said studio founder Hiroshi Nakamura. "Thereupon, I found the forest to be the subject of prayer mutual to various religions and conceptualised an architecture that prays to the forest while surrounded by trees." 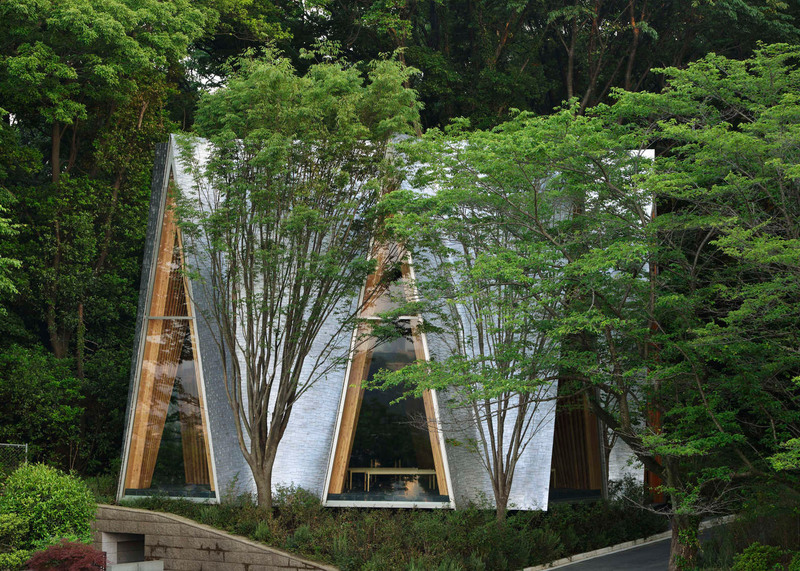 Instead of cutting back the surrounding trees to make space for the 110-square-metre building, Nakamura chose to tilt one side of the building away from the foliage. The main structure is formed from a series of excessively pointed gables constructed using larch wood beams. These meet the ground and are arranged in a snowflake-like formation. One gable provides the entrance to the building, while the others feature floor-to-ceiling glazing, ensuring the interior is filled with natural light. Each gable is connected to the next by a curved wall. 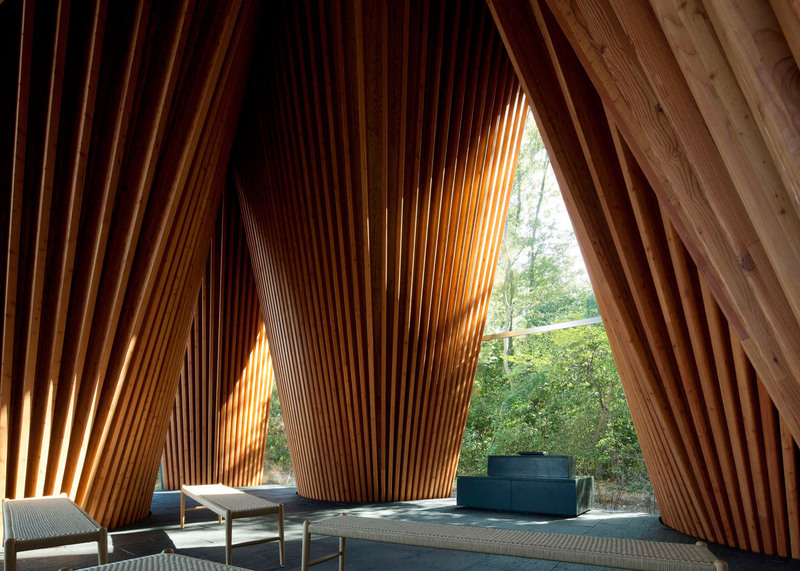 The shapes reference traditional Japanese Gassho structures, where two pillars support one another. The name of these structures refers to the shape made with the hands while in prayer. "It forms a traditional Japanese Gassho-style structure composed three-dimensionally, as two leaning beams set against each other are developed in every direction," said the architect. "When one prays, a small warm space is created within the hands as the fingers gently join," he added. "It seems as if that small space of prayer was taken out to form the architecture. As people pray, so does the architecture." 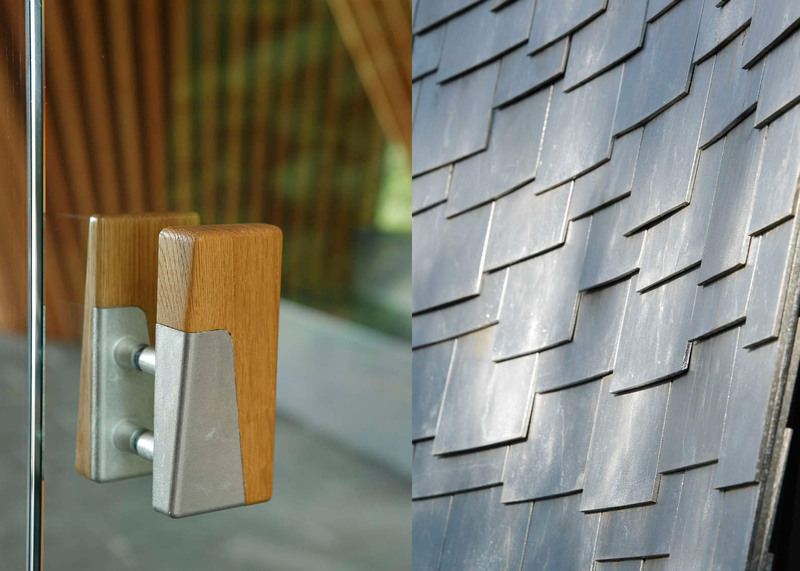 The exterior is clad in 21,000, four-millimetre-thick cast-aluminium shingles, with a ripple texture created by hand. These were bent by hand to fit flush to the curved walls of the structure. Inside, the curved walls are lined with domed strips of wood to create the effect of flaring columns. A series of benches are arranged in front of a small alter. The floor inclines by one centimetre across the space to "guide people towards the departed and the forward-bending posture for prayer." This is emphasised by the slate flooring, which is laid so that the joins point towards a vanishing point within the forest. "For those who are in deep grief and inconsolable, how can architecture nurture them?" said Nakamura. "With this in mind, I designed buildings that gently surround them and support their intentions." Completed in 2013, the chapel was named as a winner in the religious buildings and memorials category at the 2016 edition of the Architizer A+Awards, which promote and celebrate the year's best projects and products. 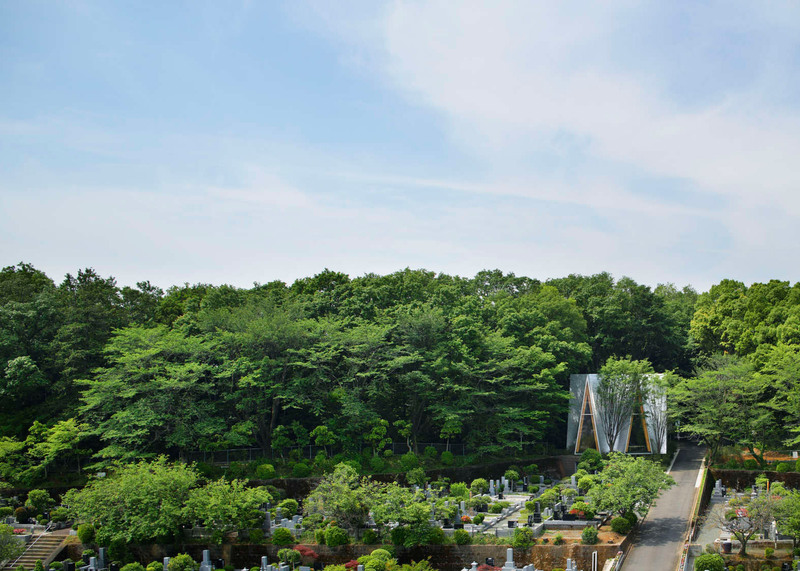 Hiroshi Nakamura & NAP previously designed a round community centre with a central garden and a sloping roof for the same cemetery, after winning a competition for the project. Other buildings by the firm include a combined showroom and home for a car dealer with warren-like interiors and a house with a shimmering glass-brick facade.